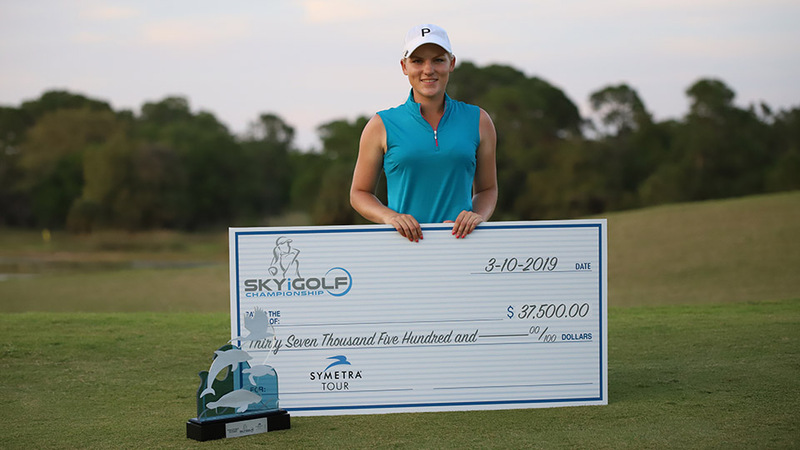 NORTH PORT, Fla. (March 10, 2019) – The spotlight on Sunday at the SKYiGOLF Championship was squarely on 14-year-old amateur Alexa Pano, who started Sunday’s final round with the share of the lead, looking to become the youngest champion in Symetra Tour history. By twilight at Charlotte Harbor National Golf Club, it was another top young player who would seize the trophy. Fitting that the very first SKYiGOLF Championship produced a winner who was making her very first professional start. Alana Uriell, 22, birdied the par-5 closing hole in regulation to join a three-way playoff, then won the championship when she buried a 12-foot eagle putt on 18 on the first hole of a sudden-death playoff. In a slow-developing final round that saved its fireworks for the close of the show, Uriell, who this time last year was playing collegiately at Arkansas, shot 5-under 67 on Sunday, then turned away Lauren Coughlin (66) and Julieta Granada (67) to prevail in her first pro start. Uriell earned $37,500 for her victory, which matches the highest winner’s payout in Symetra Tour history. Pano, who’d played so well all week, was off with her game in the final round. She managed only one birdie against two bogeys, three-putting for a bogey at the par-3 fifth and again at 18, where she settled for a final par. Her 1-over 73 left her at 7-under 281 for the week, good enough to tie for eighth place, her best showing in a professional event. “I’m pretty happy with it,” she said. “Definitely I have a lot of shots that I wished I had back, but it’s nothing to dwell on, I guess. The 449-yard 18th hole, converted to a par 5 for this week’s tournament, produced the exciting finish it was designed to produce. First up came Coughlin, a winner a year ago at the Symetra Tour’s PHC Classic. She turned a ho-hum round into something quite special with a birdie-par-birdie-eagle finish, making 3 on the last hole after hitting a 5-wood from 200 yards to 3 feet of the flagstick. The eagle gave her 66, the day’s low round, and made her the first player to get to 12 under. Next up stepped Julieta Granada, who once won a million dollars on a Sunday just down the road in Naples at the 2006 ADT Championship. At 32, she is trying to find a spark in her game, and did that this week, shooting 65 on Friday and 67 on Sunday. She hit a poor second shot into 18, then nearly pitched in for 3, her birdie-4 getting her to 12 under alongside Coughlin. Uriell was last, needing eagle to win and birdie to tie, two-putting from 20 feet to join the playoff fray. After Granada missed the green left at 18 (for the second time, she nearly holed her pitch shot), Coughlin again hit a magnificent shot, setting up a 15-foot eagle attempt that she missed on the high side. The stage then was Uriell’s and she took advantage, pumping her right fist as the ball vanished into the hole. Uriell gained LPGA status through the Q-Series in 2018 and will begin her rookie season at the Founders Cup in Arizona March 21-24.